What will life be like in 50 years? Maybe 100? 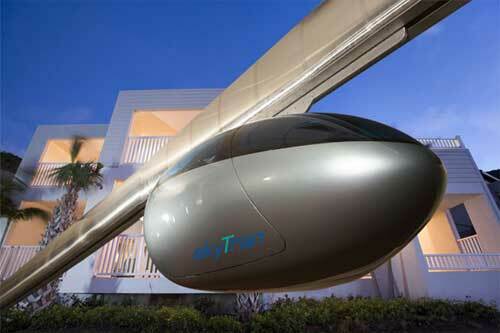 It Is Called Skytran. Cool. I’ve been thinking a great deal about that for the past week. My next book will be a science fiction novel, and I’m thinking about avoiding space. I have a great idea for interstellar narrative that I’ve been nursing for over a decade, but I’m not ready to write it yet. Instead, I think I’m shooting for some decidedly terrestrial, and futuristic. Last night Mrs. Greenbean and I sat outside and watched the sky. Mars was big and beautiful, as was Jupiter. The stars were twinkling but I didn’t spot any satellites passing by overhead. However, there were many airplanes. Our home apparently is directly underneath a major air route. As the planes traveled, I hypothesized that perhaps in the future there will not be air travel. Mrs. Greenbean challenged me on that, and for good reason. Most of our lives (at least my life as a Gen-Xer) we have been hyper conditioned to believe as technology improved, we would fly more in airplanes and even in personal flying vehicles. Conventional wisdom is, therefore, that in the future there will be more airplane or air travel than at present. However, one website indicates that airlines make 4 dollars per passenger per flight, while another cites the net profit is significantly less, only 21 cents. Regardless of which is right, it seems that profit margins are razor thin. I see this as only getting worse, and not better. Technology will drive these profit margins down, not up. Since economics is the main force that dictates the future, it is not hard to imagine a time when air travel will become too cost prohibitive, even though it is the safest and fastest means of transportation. To wit, other alternatives must be explored. 1. Maybe rail will finally reach its fullest potential. However, I doubt it. 3. Maybe no mass transit will exist in the future. Technology will be so virtual that travel will almost end because all meetings will be via communications and we will be able to walk the canals of Venice in our living room holograms. 4. I don’t think we’ll ever achieve ‘transporter’ technology like Star Trek, but maybe something where science learns how the earth’s gravity works in an Einstein kind of way (as opposed to Newtonian kind of way) and through the manipulation of quarks and other activity at the sub-atomic level, we are able to generate an anti-gravity field that allows people to “float” over the surface of the earth and therefore, truly hover. 5. Super-highways with really fast, but super safe cars. 6. There is always the possibility that in the future travel will become illegal. In that case, it is a contraband item and the way people do it is at night over ancient trails called ‘inner-tate’ by electric skateboards and refurbished Vespas. If you dream long enough, what do you think travel might be like in the future? Interesting thoughts, guess we will have to wait and see. well, that is certainly true. i just find it so much fun to speculate, especially when thinking about everyday life in the future. in many ways it will be like life today, but in other ways, it will be shockingly different.